We all love to eat potatoes, but could they serve a higher purpose as a tool for peace? Dr Sima Barmania, a British Muslim medical doctor specialising in public health, believes the answer is an emphatic ‘yes’! That is why she has founded a new charity appropriately named Potatoes for Peace TM, which helps school children to understand and appreciate cultural and religious differences in a fun, easy and creative way. Potatoes for Peace supports in-school projects where each child is given a customised toolkit and with the assistance of their teacher creates their own ‘potato person’ who is different from themselves. Each potato is given physical characteristics, such as appearance, attire, a persona and internal characteristics such as a name, personality, occupation and hobby. For example, David Potato, who is Jewish, is wearing a Kippur. And although David Potato wears a Kippur, many Jews do not wear one. This is an entry point for class discussions that can be used to question stereotypes. Each child assumes responsibility of their potato person for two to three weeks, during which time it ages and wrinkles just like a real person and becomes the child’s Potato friend. 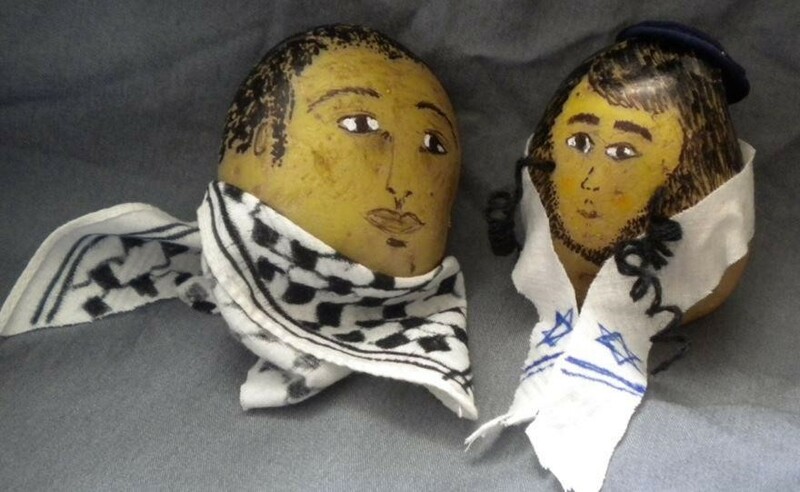 Potato people: Taysir Ali (pictured on the left) is a 23 year old Palestinian engineering student from Ramallah, who is seen talking with David (pictured on the right), a 40 year old Israeli lawyer from Tel Aviv. Sima explains that, “children are very much a product of their environment and can build up prejudice and negative stereotypes from an early age. Often this can act as the foundation for intolerance and conflict later on. “If we wish to create a culture of peace we need to think about the prevention of conflict in the first place; in the same way as we would implement any preventative public health measure – by considering peace education and peace building. Potatoes for Peace is still in the early stages, running pilot projects with schools in the London area, but they believe good potatoes can travel far and wide. They would love to have your help with growing the charity from a local project to an international force for change. If you would like to contribute your PR, sponsorship or strategic marketing expertise to support the growth of Potatoes for Peace please get in touch with Anna Mullenneaux, Chief Matchmaker at Pimp My Cause at [email protected].